District 37, known as Western Gem, was formed November 8, 1886. The schoolhouse was originally located on land belonging to B.F. Latta, in the SW corner of the SE4 Sec.17-R27-T30. According to first-hand stories this schoolhouse was an abandoned sod house. 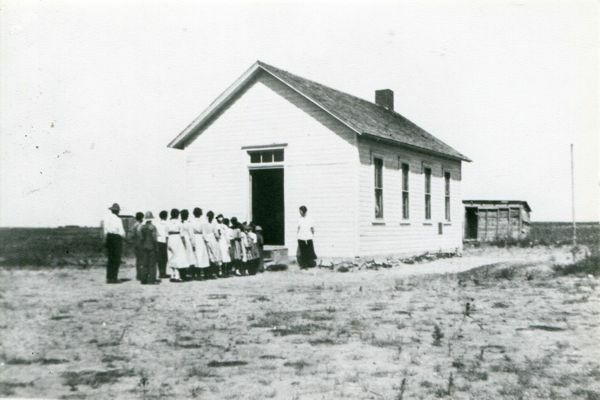 About 1916, the schoolhouse moved a half-mile southeast to the SW4 of the NW4 of Sec. 21-R27-T30. This would have been the location of the frame building shown in the photos. 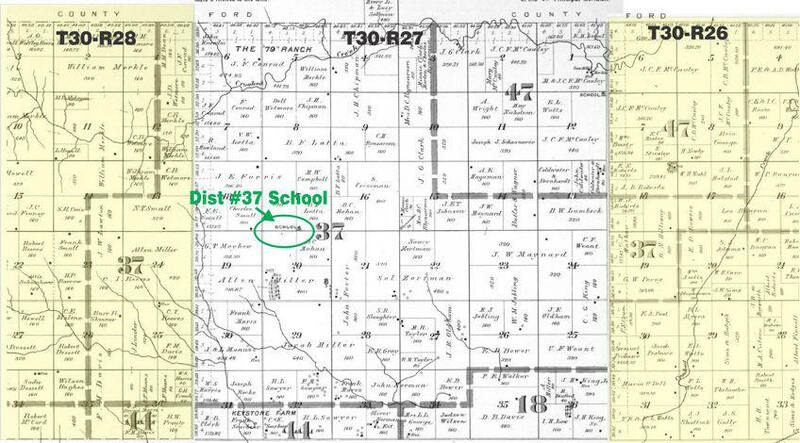 This school district disorganized March 1, 1946, and consolidated with Joint 72, and later unified into USD#225. Surnames of students who attended Western Gem over the years: Beckman, Boman, Boyd, Bradley, Britton, Brown, Carlson, Chipman, Clement, Crissman, Crouch, Cunningham, Diller, Dowell, Fansler, Fike, Finkeldei, Foster, French, Gooden, Hardy, Harris, Harrison, Harshberger, Hipp, Horner, Howell, Huelskamp, Johnson, Lampe, Leatherman, Linder, Mahan, Marrs, Masters, McBee, McBeth, Nash, Nelson, Norman, Padgett, Plymale, Porter, Price, Pullman, Ralstin, Reeves, Shogrin, Sutton, Vann, Wells, Wheeler, Zimmerman, and Zortman. 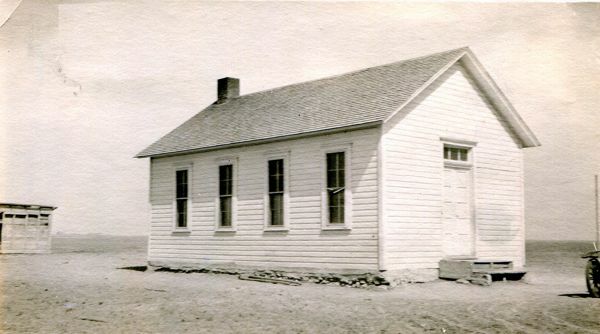 After it disorganized the Western Gem schoolhouse was moved to Fowler and served as the school lunch room. Later it was purchased by Roy Clark for his home. 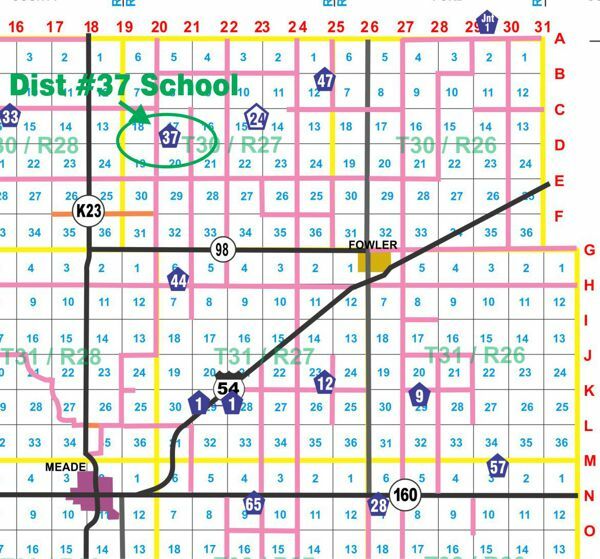 The map above is made by splicing three pages of the old 1909 Plat Book together in order to show the entire school district #37. The teacher list at left has many missing in the early years of the school. …Schools were distant to many of the children. My parents, aunts and uncles went to Western Gem and later both parents taught there. School terms were short as most children had to help on the farms, and in the home. Never-the-less they had good times. There were literary societies, spelling bees and Christian Endeavor. My father and uncle would ride horse back to these affairs with the lady of their choice riding behind. Often a group of young folk would go by lumber wagon, spreading a robe over the hay to sit upon. They thought nothing of the ten mile trip, and this was part of the evening's enjoyment. My father often recalls those “good old days” and wishes he could hear singing like they used to have. …As late as 1896, our school was held in a dugout that at one time had been a residence. Here we were taught the "Three R's" and the Golden Rule, also respect for the aged and reverence for God. Last fall, when Miss Oneita Kissel planned her school work for the coming term, she wanted to have something different in the way of activities for the last days of school. This something must be educational as well as entertaining. The thought of a trip came to her mind. When voiced, the children promptly agreed this would be a grand way to close the school year. But then the question of financing such a trip came up. It was Miss Kissel’s idea to buy some pigs or calves and let the youngsters feed and care for them until the last of school or until the stock was ready to market. The parents were consulted and promised their cooperation. In the latter part of November, Miss Kissel bought three small pigs and a young calf. Two of the pigs and the calf were taken by the school children to be fed and cared for; the third pig was taken by the teacher. The last day of school April 21, a basket dinner was held and soon after noon the livestock was taken to Meade and sold. The money it brought was more than most of us expected due to the good advertising of the Meade Sale Company. Well, at last the long dreamed of and much planned trip could be a reality. So, bright and early Tuesday, April 25th, the youngsters, Miss Kissel and three of the mothers started on the tour of Kansas. The first stop was in Hutchinson where the salt works were visited. Then on to Salina to see the Historical Indian Burial Pit. This was very interesting to the children since part of them had studied about the Indians in their unit work in school this year. Manhattan was the next stop. The group spent the night in Manhattan and before leaving the next morning visited the college and campus. Topeka was the next place of interest. They were shown through the State House and visited WIBW. Some pictures were taken here of interest to school children. Then on to Lansing. A ball game was in progress at the State Prison so the group didn’t go through the prison as all work stops when closed for a game. Kansas City was the stop for the second night. The following day and night were spent in Kansas City, Missouri. The parks, the zoon, Union Station and a good show. A visit to the large department stores and many other interesting things were taken in by the children here. Friday morning the group started on the trip back. They stopped in Newton to visit the Honn family, relatives of Miss Kissel’s and former Meade County residents. From Newton they drove to Wichita where they took in a carnival and camped for the night. Saturday morning the group drove to Pratt where about two hours were spent visiting the State Game and Fish Hatchery. From Pratt on to Fowler, arriving home about 4:30 p.m. This trip is one that will be forever remembered and associated with the school days of these children. Western Gem school is located in the Artesian Valley north of Meade. The children attending the school this year are: Billy Harris, Jo Bradley, Richard Bradley, Max Zortman, Phyllis Boyd, MaryBradley and Jean Bradley.